The pinna is formed from the coalescence of six tubercles, and development abnormalities are common. Also deformities could be seen later on in life following trauma or infection. Some of the common deformities are shown here with brief description. 1. Duplication of the lobule: It is of of little clinical importance, other than cosmetic worry mostly in females. 2. Hillocks (or accessory lobules): These are commonly found anterior to the tragus, and are excised for cosmetic reasons. A small nodule of cartilage may be found underlying these hillocks. 3. Darwin’s tubercle: A deformity of the pinna of phylogenetic interest. It is homologous to the tip of the mammalian ear and may be sufficiently prominent to justify surgical excision. Although Darwin’s name is used for this tubercle, Woolmer gave the first description. the case, behind the fold of the helix, rather than in the more obvious anterior site. 6. 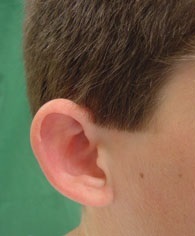 Prominent ears: The fold of the antihelix is either absent or poorly formed in a prominent ear; it is not simply that the angle between the posterior surface of the conchal cartilage and the cranium is more “open.” Parents and child may be offended by the diagnosis of “bat or lop” ears, although these terms are commonly used. Prominent ears are best corrected between the ages of four and six years at the beginning of school. There is, however, no additional surgical problem in correcting adult ears. Youngsters may be the subject of considerable ridicule in early years because of bat ears and, therefore, surgical correction is not to be deferred. Radiotherapy or local triamcinolone injections following excision reduce the incidence of recurrence of the keloid. Pressure at the site of keloid excision has also been shown to reduce recurrence. 8. Trauma to the pinna. The projecting and obvious pinna is a frequent site for trauma. Partial or complete avulsion is common. The loss of tissue shown in this picture is from a bite. Although small loss of the periphery of the helix can be closed with a wedge excision, larger loss requires more complex surgical repair involving cartilage graft reconstruction of the helix. 9. A sebaceous cyst : The punctum is mostly apparent and is diagnostic. Sebaceous cysts are common behind the ear, particularly in the postaural sulcus. 10. Hematomas of the pinna following trauma. Bruising with minimal swelling settles. A hematoma or collection of serous fluid, however, is common, and these, particularly if recurrent from frequent injury and left untreated, will result in a “cauliflower ear.” The fluid, if aspirated with a syringe, usually recurs, and incision and drainage may be necessary. 11. Perichondritis: A painful red, tender, and swollen pinna accompanied by fever, following trauma or surgery, suggests an infection of the cartilage. The organism is frequently Pseudomonas pyocyanea.